The Pilatus PC-12/47E is a pressurised single turbine powered low-wing utility aircraft for up to nine passengers developed and built by Pilatus Flugzeugwerke AG, Stans, Switzerland. Development of the Pilatus PC-12 started in 1987. The first prototype (HB-FOA c/n P.01) was flown on 31 May 1991. Certification of the type was originally planned for mid-1991, but a redesign of the wings to improve the perfomances of the aircraft delayed this. The second prototype (HB-FOB c/n P.02) was flown on 28 May 1993. Swiss certification finally took place on 30 March 1994, and CAA approval followed on 15 July 1994. The same year, the Royal Flying Doctor Service of Australia was the launch customer of the PC-12. In 1996, the original production variant PC-12/41 was replaced in production by the PC-12/45 with an increased maximum takeoff weight. Both the PC-12/41 and PC-12/45 and the 2005 PC-12/47 model are powered by single Pratt & Whitney Canada PT6A-67B engine. The engine drives a four-blade Hartzell propeller. The PC-12 features a landing gear designed for grass and unprepared airfields and has winglets for fuel economy. The Pilatus PC-12 is certified for single-pilot IFR operations, though operators may choose to utilize a second flight crew member. Pilatus offers the PC-12 in a standard nine-seat airliner form, in a four-passenger seat/freight Combi version, and as a six-seat corporate transport with an option for a seven-seat by adding a three-seat bench in place of seats five and six. For the freight variant is a large cargo door available. In October 2006, Pilatus Aircraft announced its next generation PC-12 (PC-12 NG) that features a fully integrated Honeywell Primus Apex avionics system; a new cockpit designed by BMW Group Designworks USA; a more powerful Pratt & Whitney Canada PT6A-67P engine, flat-rated at 1,200 shp; dual-zone Environmental Control System for increased cockpit and cabin comfort; a fully automatic digital Cabin Pressurization Control System which requires no input from the pilot; and a fully redundant Power Generation and Distribution System. Known by its trade name PC-12 NG (Next Generation) this PC-12/47E variant was certificied in 2008. The PC-12M Spectre variant is a paramilitary special missions platform marketed in the United States, originally called "Eagle". In United States military service the PC-12 is designated U-28A. Over 1550 Pilatus PC-12 aircraft are delivered since 1994. Pilatus PC-12/47E c/n 1160 was testflown as HB-FSO and was registered D-FNAH.in Germany on 23 November 2009. 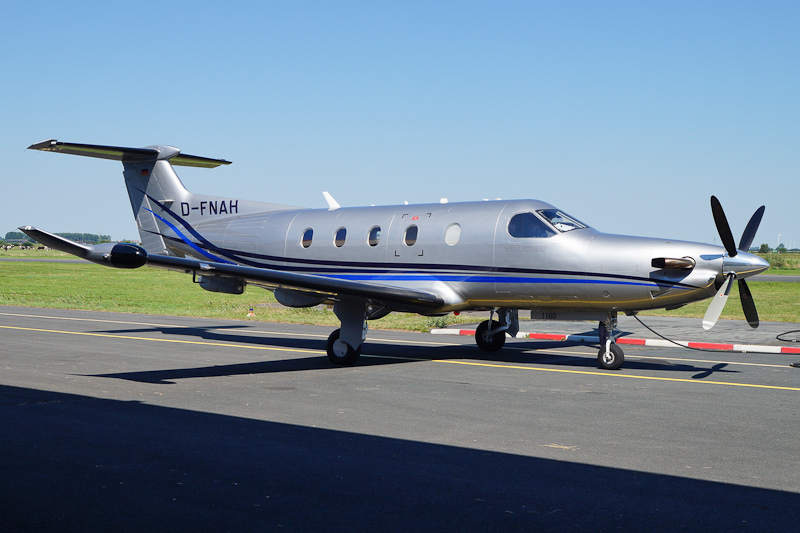 Pilatus PC-12/47E D-FNAH was seen at its home base Leer-Papenburg on 23 July 2014.